I found this amusing dataset in high school while trying to use a horrid statistical package (version 1 of DataDesk, I think). To the naive eye, it looks like evidence that radios drive people mad, or did so back in the England of the 1920s and ’30s. The units are millions of radio licenses issued in the U.K. vs. number of “notified mental defectives” per 10,000 of estimated population. The correlation coefficient is 0.99 and the P-value is on the order of 10^-10. There are a number of lessons we can learn from this — correlation does not prove causation, how to do labels by each point in Mathematica using the Epilog command, and to remember to shut off your radio. How do we make such a graph? The labels are going to be included in the graph using the Epilog command. This can be done at the time we run the Plot command but I find it easier to run it first for clarity and ease of debugging. We could call it complete here, though I prefer to show the regression line on the same axes as the points. We’ll determine that line with the Fit command, then graph it, and combine it with the dotplot using the Show command. This gives us the graph seen at the top of this post — data nicely labeled, with the regression line shown. Sometimes it’s best to leave the PlotMarkers blank and just use the labels (the years in this case) as markers, Edward Tufte style. The hard part is getting the Epilog right, as that puts the labels in the right places. I hope this example has been useful. You can get Pearson’s correlation coefficition with the Correlation command. 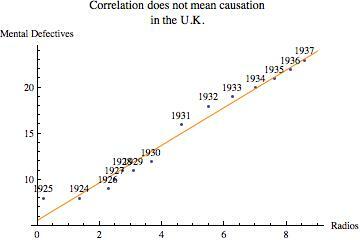 It’s about 0.99. Credit where credit is due, this data seems to have been originally compiled, and offered as an illustration of spurious correlation in “An Introduction to the Theory of Statistics” by G. E. Yule and M. G. Kendall in the early 20th century. This entry was posted in mathematica on June 26, 2010 by stern.